NOYON JYOTI PARASARA, SANSKRITI MEDIA, MUMBAI: After Salman Khan, now Aamir Khan too has bad-mouthed Shah Rukh Khan in the media. What do you think about these Bollywood superstars declaring a media war on each other? Are these simple publicity gimmicks? What are the consequences? You have handled Vivek Oberoi, who has faced the brunt of Salman Khan's statements earlier. Does this new superstar war affect him too? DALE: Though Vivek’s case is a completely different story, what’s been happening between Shah Rukh and Aamir seems to be a good pastime for the tabloids as well as the masses. In times of downturn, such controversies can not only get our stars a lot of free nationwide media mileage, but can go a long way in consolidating their positions by the time recession ends. See, ‘Amitabh Bachchan ran away with Rekha’ will always make a better copy than ‘Laloo Prasad ran away with a train’. Media has always been great headlines, great stories and great packaging to me. 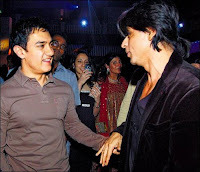 Both Aamir and Shah Rukh are PR masterminds, and this tu-tu-main-main game is going to benefit both of them. By the way, do you think they are naïve enough, not to know this! My experience (and I have had a lot of this kind) tells me that media; the so-called watchdogs of society; as well as the masses are going to ‘act’ gullible this time too. They will lap up every word and quotable quote Aamir, SRK and the entire industry will give in reaction.